Portable drives are very handy gadgets. Even though they’re not as portable as USB flash drives, they do make up for it with larger storage capacities. Because of this, USB connected portable external drives have become essential accessories to have at your disposal if you own an ultrabook, netbook, or a personal computer running out of native storage. So as not to defeat the purpose of possessing an ultrabook or netbook, most external hard drives have been getting smaller and smaller. Manufacturers figured out that big and bulky aren’t always equivalent to large storage capacities. The result is a constant offer of slim and small form factors. And whether it’s about storage capacity or slim form factor, Silicon Power’s Diamond D20 does not disappoint. 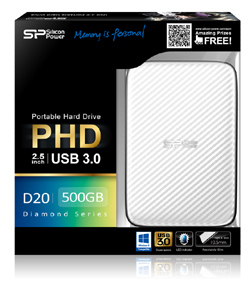 The Diamond D20 is Silicon Power’s new offer in the area of USB 3.0 external drives. Designed to make a fashion statement as well as take care of your storage needs, the Diamond D20 features a striking black and white casing made of solid aluminum metal. 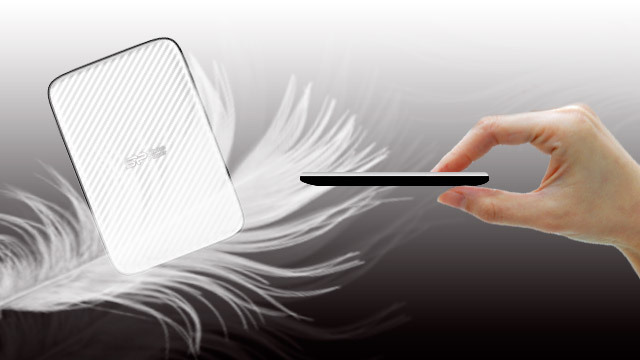 The casing is designed with a texturized, carbon-like surface that’s scratch-resistant. The corners of the device are rounded. The general impression given off is that of simple sophistication that can withstand some accidental bumps here and there and not show it as readily as other portable drives. A pragmatic touch is added in with the presence of an LED power-on and transfer activity indicator light and a power-saving sleep mode. Though its design is the main attraction for the Diamond D20, it still performs up to specifications. Its USB 3.0 bus interface means a maximum data transfer speed of 5 GB/s, a huge improvement from the USB 2.0 max transfer rate of only 480 MB/s. The jump from USB 2.0 to USB 3.0 isn’t a superficial improvement either; users should be able to notice a significant reduction in moving files from a computer to the external drive or vice versa (most especially when the transfer involves some hefty files). For now, the Silicon Power Diamond D20 only comes with one storage capacity, 500 GB, but that’s a standard that doesn’t detract much, if it does at all. Apart from being USB 3.0 and 500 GB, the portable drive also features some security measures in the form of pre-loaded Silicon Power Widget software (seven backup and security tools total). The Silicon Power Diamond D20 comes with a three-year warranty and is compatible with the major operating systems. There’s no official release about the price yet, but expect to find online retailers such as Amazon, Newegg, and Frys selling it upon market introduction. This entry was posted in Silicon Power and tagged External Hard Drive, pertable hard drive, Silicon Power, USB 3.0 Hard Drive, USB Hard Drive. Bookmark the permalink.